I believe in the possibility of a zombie apocalypse and wish to prevent it. I believe that zombies are, or at least appear to be, evil. I believe zombies come in at least two varieties, and that there are cultures that are zombies to each other. What are zombies, apart from bad? Zombies are people that are mindless. As the great (as yet untranslated) work by Nakajima argues, the Japanese are, from a Western, Kantian, point of mindless. 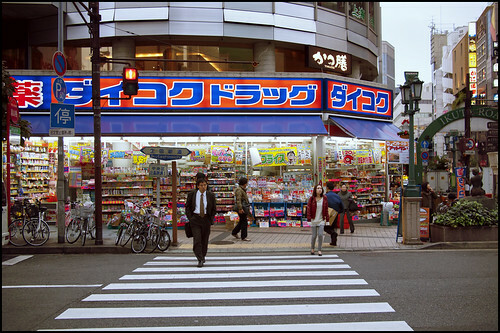 The Japanese walk through retail establishments, and bullet trains, and streets almost ignoring the linguistic public announcements, and endless linguistic tape recordings, as if there is nothing worthy of their attention. Language, the holy logos, is just background noise. Further as Kim demonstrates, in her mind blowing paper, language does not improve, but actually gets in the way of East Asian thinking. This is because East Asians or at least Japanese lack the linguistic other, the third person perspective on self that would allow them to linguistically reflect upon their actions (Mori, 1999). On the other hand, as Masuda and Nisbett (2006) demonstrate demonstrate, Western are zombies in that they are comparatively unaware of what there is to be seen. Westerners only focus upon, only cognise, only notice the central aspects of our environment, because, in my opinion, we focus on those aspects that we can linguistically describe. Further, westerners lack the power to "hansei" or literally reflect because they lack the visual other, the third person perspective on self (Heine, et al. 2008). From a Western point of view, the Japanese are zombies. They are so caught up in the environment that they hardly notice announcements such as the endless loop tape player pictured above (top), and not feel that these voices are animate, that they are being spoken to. From a Japanese point of view Westerners are zombies. We, Westerners are so caught up as we are by our (linguistic) thoughts, we do not notice the changes that are going on around us. We do not even notice that gorillas are in our midst (Simons & Chabris, 1999). We can put statues all around our towns and cities, and not feel these statues are animate, or that we are being watched (above bottom). We are zombies to each other. To the Japanese, the voice is fluff and not the voice of conscience. On the other hand, to Westerners the image is "mere image," and not the mirror of heart (c.f. Chamberlain, 1982, Preface). I guess therefore that there may eventually be another war between the Japanese and Westerners. I hope that that war is carried out as far as possible in art and literature rather than in physical violence. As Zombie comedy shows, zombies need not be felt to be evil but just wacky and amusing. Heine, S. J., Takemoto, T., Moskalenko, S., Lasaleta, J., & Henrich, J. (2008). Mirrors in the head: Cultural variation in objective self-awareness. Personality and Social Psychology Bulletin, 34(7), 879-887. Nakashima, Y. 中島, 義道. (1999). うるさい日本の私. 新潮社. Nakashima, Y. 中島, 義道. (1997). 「対話」のない社会―思いやりと優しさが圧殺するもの. PHP研究所. The Mirror of the Japanese is not the Gaze of the others, a photo by timtak on Flickr. The majority of research on the effect of mirrors finds that looking in a mirror is NOT the same as being looked at by others, or being aware of the gaze of others (Brockner, Hjelle, & Plant, 1985; C. S. Carver, 1975; Charles S. Carver, 1977; Charles S. Carver & Scheier, 1981, 2001; Davies, 1982; Dijksterhuis & Knippenberg, 2000; W. J. Froming, Walker, & Lopyan, 1982; William J. Froming & Carver, 1981; F. X. Gibbons, 1978; Frederick X. Gibbons, Carver, Scheier, & Hormuth, 1979; Frederick X. Gibbons & Gaeddert, 1984; Goukens, Dewitte, & Warlop, 2007; Hormuth, 1982; Macrae, Bodenhausen, & Milne, 1998; Porterfield et al., 1988; M. F. Scheier & Carver, 1980; M. F. Scheier, Carver, & Gibbons, 1979; Michael F. Scheier, 1976; Michael F. Scheier, Carver, & Gibbons, 1981; Spengler, Brass, Kühn, & Schutz-Bosbach, 2010) at all. Indeed some research shows that looking at oneself in a mirror produces exactly the opposite effect as being looked at by others. Being looked at by others encourages people to conform to other's expectations. Looking at a mirror generally encourages people to conform to their own internal standards. There is some research however, that has shown mirrors to increase private self awareness, and at least one paper that has argued that mirrors increase conformance. So bearing in mind that Japanese are largely unaffected by mirrors (Heine et al, 2008), what does this suggest? 1) That as in the minority of experiments that show mirror's increase public self awareness, and increasing conformance (Diener & Srull, 1979; Govern & Marsch, 1997; Plant & Ryan, 2006; Wheeler, Morrison, DeMarree, & Petty, 2008; Wiekens & Stapel, 2008; Zanna, 1990) the mirror that they are mentally simulating is "the eyes of the world" (seken no me 世間の目）. This is quite likely, and I predict in part true. 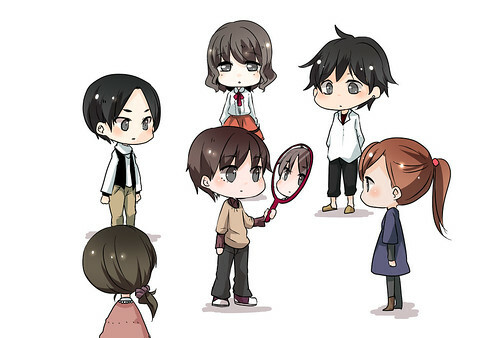 Mirrors are found to increase both public AND private self awareness, so it seems likely that the mental mirror of the Japanese has both of these effects. The "Interdependent self" (Markus and Kitayama, 1991) of the Japanese is not an absense of self but a self that is both aware of itself, and aware of the impact of others upon itself. The dual influence of the Japanese mental mirror would explain the two aspects of the Japanese self. 2.1) motivated in different ways by curiosity (leading to self reflection) and a automatic, morbid desire to see the self (rumination)(Trapnell & Campbell, 1999). 2.2) It is also argued that Private self awareness has a motivational and cognitive aspect: on the one hand is an awareness of internal self states and attitudes, and on the other it is the desire to reflect upon the self(Grant, Franklin, & Langford, 2002). It may be that the Japanese are high in the second ruminatory, motivational element of private self-awareness which is not coupled by an increase in self-cognition, as Ma-Kellams recent research tends to suggest. 3) The Japanese have a different type of independent self, that sees itself from the positition of a super-addressee, Other or God (known in Japan as Amaterasu the sungoddess) visually, with an aesthetic rather than logical impartiality ([Adam]Smith). Whatever way you cut it however, seeing oneself in a mirror is different from being seen by an audience. In order to unpack this distinction, I claim it will be necessary to reject the argument that the Japanese are "collectivists" in the sense of being socially dependent, since the mirror that the Japanese carry with them also provides a impartial, objective, viewpoint because it is a "riken no ken," a view of self not from that of others, but from a self away from self. The excellent, for my purposes, image is original artwork by Ms. Miho Fujimura. Brockner, J., Hjelle, L., & Plant, R. W. (1985). Self-focused attention, self-esteem, and the experience of state depression. Journal of personality, 53(3), 425–434. Carver, Charles S., & Scheier, M. F. (2001). On the Self-Regulation of Behavior. Cambridge University Press. Hormuth, S. E. (1991). The Ecology of the Self: Relocation and Self-Concept Change. Cambridge University Press. Macrae, C. N., Bodenhausen, G. V., & Milne, A. B. (1998). Saying no to unwanted thoughts: self-focus and the regulation of mental life. Journal of personality and social psychology, 74(3), 578–589. Zanna, M. P. (1990). Advances in Experimental Social Psychology. Academic Press. In card form for distribution. Individualism and Collectivism in Magazine Photos, a photo by timtak on Flickr. There can be no doubt that at the level of linguistic philosophy, the Japanese espouse harmony and cooperation, whereas Westerners espouse personal liberty and individualism. How about in the real world? I find the Japanese to as individual as the English. The excellent review paper by Beth Morling (Morling & Lamoreaux, 2008), "Culture outside the head," however reaches the opposite conclusion, so I thought I had better see what it had to say. The first paper reviewed paper I could download, claimed that since Japnaese adverts used more imagery and were less likely to mention the product directly, they were therefore colectivistic; trying to build up a relationship with the purchaser (Javalgi, Cutler, & Malhotra, 1995). I thought that this analysis was unfair. Readers of this blog (?!) would know that it is my opinion that Japanese use imagery because they identify with images and have a God (or generalised other) that looks rather than listens (Leuers & Sonoda, 1999b). While clicking around on analysises of print media, however, I cam up with a result that made me pleased. Wang (2006) noted that Taiwanese magazines are Westernised and that collectivist messages (table page 73) and individualist messages (table page 68） are aboult equal at the linguistic level in adverts in Taiwanese and American magazines. Let us assume that this result is due to Westernisation. However, Wang also noted that when it comes to photographs, Taiwanese magazines are more likely to show individuals (Taiwan 73.1%, US 59%) and correspondingly far less likely to show groups (Taiwa 26.9%, US 41%) (see table page 65). This is not at all unusual. Japanese magazines are lonely (or narcissistic). Their protagonists are displayed on their own. This result mirrors that found in my research on autophotography (Leuers & Sonoda, 1999b: see Heine 2007, p213). Japanese autophotography displays not only more positivity, but more pictures of self, whereas American photos show more pictures of other people. Having a look at some Japanese and American fashion magazines, it seems that the same pattern is repeated. American women want to be kissed and appear with men in US Cosmopolitan. Japanese women are more self-reliant and rarely show men in their magazines (or collages) because men's demands for affection are rather annoying (uzai). Westerners are linguistically individualist since they consider themselves to be linguistic entities (narratives) and try to differentiate their narratives from those of others (largely unsuccessfully, see Leuers & Sonoda, 1999a). Japanese see themselves as their self-images, first and foremost their face (Watsui), and as seperate embodied existances they yearn for communitas and harmony which they express in their "let's make friends" philosophy of harmony (Yamagishi, 2002). In any event, I do feel that at a personal level the Japanese are extremely self~possessed, self-reliant and difficult to push around. Anyone married to a Japanese woman should know that, but despite the fact that some famous cultural psychologists are, they do not reach the same conclusion. I guess that they presume that they have married an unusual Japanese. (You know who I am thinking of...Fat chance that he reads my blog). Heine, S. J. (2007). Cultural Psychology (First ed.). W. W. Norton & Company. Morling, B., & Lamoreaux, M. (2008). Measuring culture outside the head: A meta-analysis of individualism—collectivism in cultural products. Personality and Social Psychology Review, 12(3), 199–221. Americans are called individualists. Japanese are called collectivists. At the level of the prevalent philosophies pertaining in each culture, these are fair descriptions. 2) All social behaviour has both aspects, and can be labelled in both ways. Westerners tend to think that the self is independent, and that groups are just for joining. The biggest distinction that groups have is that they are dangerous, in that they are seen as having the potential to de-individuate, or de-personalise; make their members forget about the unalienable individuality that they had in the first place. Japanese, tend to think that the self is interdependent: created by groups and social bonds without which they would hardly have any individuality at all. Individuals and groups are mutually creating. I have heard cultural psychologists group collectivism with the latter interdependent view of self, not without just cause. But it should be remembered that there is a paradigm shift separating the old "Individualism Collectivism" theory from that of Markus and Kitayama. The latter is a theory about theories. This fact can be forgotten. Importantly, from a "Interdependent" perspective, individualism and collectivism do not exist , or at least they are not opposed to one another. Every so called "individualist behaviour" is made possible by social relationships, and every collectivist behaviour is formative of and beneficial for individuals. In so far as every human behaviour is social (other than the most basic, and then even those), all behaviours therefore have a collective and individual aspect. Lets consider some examples. Risky Shift (group polarisation: Stoner, 1961: see e.g. Isenberg, 1986) is something that is found in the US but far less so in Asia. Risky shift is the tendency for Western groups to behave more riskily after group discussion - such as the Bay of Pigs, Cuban invasion disaster. The generals that got together to discuss what to do about Cuba started out moderate but converged on an initially extreme, and risky decision, to invade Cuba. In Asian on the other hand, Isozaki's research tried hard but failed to find persuasive evidence for risky shift in Japan. Sometimes the opposite -- cautious shift -- is found, in 1/3 of Isogaki (1981) experiments and cautious shift in groups (Hong, 1978) and just by giving reasons (Briley, Morris, & Simonson, 2000a, 2000b) is also found among Chinese. In accordance with the stereotype, it is explained that extreme actions, appearing unique, are highly evaluated in Western culture so groups tend to converge on the most daring of options, whereas Japanese value harmony and converge on compromises. Consider another behaviour, pictured in the above photo. It is described by Japanese comedian Beat Takeshi's adage: "Red Light, Everyone Crosses, We aren't scared"（赤信号、皆で渡れば、怖くない). The lady at rear looks like she she is following or conforming to the red-light breaking behaviour of the guy striding out in front. She isn't scared, because someone else is doing it. So is she being a collectivist? Yes and no. In general, crossing the road in this way, free loading on the cognitive effort of other road crossers, especially when there are a lot of them, might also be described as an individualist behaviour. On the other hand again, risky shift (group polarisation) may be more similar to the above "Red Light, If everyone crosses, We're not scared" phenomena. All those generals that got together and decided to invade Cuba may have been thinking"well everyone else here thinks it'll be okay". Indeed one explanation of risky shift is that people in groups feel less responsible and make riskier decisions due to the evasion of responsibility. Both crossing the road in groups and risky shift have their negative aspects. The guy in the photo above may be in a daze too and a truck may be coming along. Unfortunately, there was a truck, called Castro, coming along and the bay of pigs invasion was a disaster. Both these came up in the same factor in a recent study on individualism. I think that, perhaps excepting the above photographed example, when Japanese choose harmony, they are often be doing it quite mindfully and deliberately, and when Westerners choose uniqueness they are often not being so mindful, even though they may debate at length. Isozaki, M. (1984). The effect of discussion on polarization of judgments. Japanese Psychological Research, 26(4), 187–193. Stoner, J. A. F. (1961). A comparison of individual and group decisions involving risk Unpublished master’s thesis, School of Industrial Management. MIT. 橋口捷久. (1974). 集団内の意思決定者数とリスク・テイキングの水準. 実験社会心理学研究, 14(2), 123–131. As demonstrated by Hamamura and Heine (2008;Hamamura, Meijer, Heine, Kamaya & Hori, 2009), the Japanese have a prevention, as opposed to promotion, regulatory focus (Higgins and Spiegel, 2004), or motivation style. This means that the Japanese hare happy when nothing goes wrong, or if all goes smoothly (todokoorinaku　滞りなく) and they don't care if things are especially "wow". Westerners are more inclined to want the "wow"-- something raw and unique -- and they are less concerned if there are a few mishaps along the way. These differences in what motivates the Japanese and Westerners are especially visible in hospitality preferences, so tourism providers should take note. To Japanese, Western hospitality can seem hapzard, scruffy, or poorly planned. To Westerners, Japanese hospitality can seem clinical, hermetically sealed, mass-produced. Japanese weddings parties are a prime example of flawless, raw-less hospitality of Japan. This particular wedding party had a spontaenity and uniqueness that I had not experienced before. It should be remembered that the Japanese hold an after-party (ni-ji-kai), and a after-after-party (sanjikai) where there is much more spontaneous "wow". Thank you for inviting me. I had a great time. Social Loafing in Japan Revisited, a photo by timtak on Flickr. 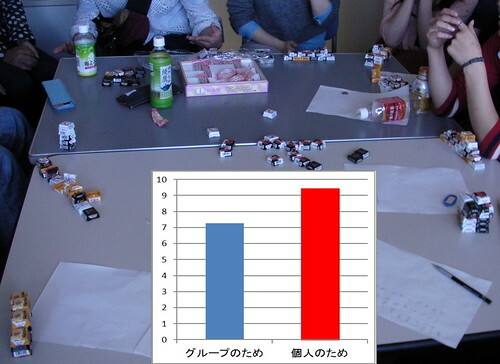 Nakano, one of my seminar students, did a replication of the classic experiment on social loafing (Ringleman, 1913; see Kravitz & Martin, 1986), using a chocolate grabbing task. Earlier replications of this experiment have shown mixed results. In a shouting task, Latane, Williams, & Harkins (1979) found social loafing present pan-culturally, even among subjects from Malaysia, Thailand and Japan. In a similar task Shirakashi (1984) found no social loafing among Japanese. Furthermore two studies (Gabrenya, Wang, & Latane, 1985; Matsui, Kakuyama, & Onglatco, 1987) found the reverse effect, social labouring or social effort in counting tasks among Taiwanese and Japanese Children. Early (1989,1993) found in a tendency towards social labouring among Hong Kong Adults, and Karau & Williams (1993) in a review of social loafing research in the West and Asia found an overall tendency for Westerners to loaf and for Asians to labour with greater effort. Kugihara (1999) found that Japanese females do not loaf but that Japanese men do, and that the tendency to loaf was related to the tendency to have an interdependent self concept (Markus and Kitayama) which is itself decreasing in Japan. 2) Being told that they would receive all the chocolates that they themselves grabbed. Fan as I am of the Koushien Baseball Tournament I was hoping my students to "become one circle," and try harder in the group condition but the conditions for Japanese social effort, did not seem to have been met. Only one student grabbed more chocolates in the group condition. The order of the grabbing and the degree of encouragement received from the experimenter (who was not blind to the experimental conditions, had been persuaded by social loafing research) may have affected the result. Shirakashi, S. (1984). Social loafing of Japanese students. Hiroshima Forum for Psychology, 10, 35–40. Dangerous Water Channel, a photo by timtak on Flickr. As someone pointed out (B?) there are a lot of dangerous water channels in Japan with low or non-existent guard rails, in streets with no street lighting. This channel has no railings in some areas despite being 2 metres deep. This level of physical danger exists in spite of the fact that saftey from attack is not only non-existent, but there are emergency "I am being attacked" alarm/phone stations every 50 yards along the main street coming from university. Danger caused by others is treated by with great concern, but danger due to personal "negligence" (such as not looking where you are treading) gets short shrift. Who said that Japanese do not allow their populace to do things at their own risk (jiko-sekinin de)? Having said that, I think that this difference is more to do with the prevalence of irrigation channels in this rice farming nation rather than any difference in perceptions of personal safety. 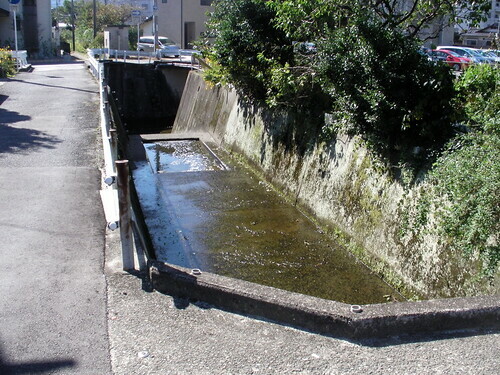 A foreign student at Yamaguchi broke their arm falling into one of these channels. A foreign visitor found a dead Japanese man in one of these channels on a Sunday morning. Those under the influence of alcohol are particularly at risk. Visitors to Japan beware. But also bear in mind that in late May the channels, or this one in Itoyone, are populated by fireflies. KANEKO Misuzu was a poet from Nagato in Northern Yamaguchi who lived at the beginning of the 20th century. She had a tough childhood, being sent to a foster home at the death of her father, then re-fostered by her mother's second husband, she found herself treated as a "foster child" even by her, by now estranged, mother. Leaving home, she ran a bookshop in Shimonoseki, the largest town in Yamaguchi Prefecture and wrote poetry, about 500 poems and songs mainly for children, of which 50 were published in her lifetime. It was after her marriage however that her life became even more tragic in that her husband requested that she give up poetry and concentrate being a "housewife". When she refused, he took to having mistresses or at least prostitutes, and when he gave her a veneral disease she decided to leave him. At first she thought that she would have custody of her children but when they were taken from her, she committed suicide at the age of 27. I imagine that she genuinely and fervently wished that her significant others would treat her on her merits, rather than according to her station or role (foster-child, housewife), so her most famous poem, in my translation below strikes me as being, very understated. I often assert that the Japanese are just as individual as Westerners. I still think that this is true but it is also true that there are strong philosophical and cultural encouragements to fulfil ones roles. I think that this is because the Japanese are so individualist and full of self-love that their society would fall apart if they did not promote harmony and role-fulfilment. Perhaps Kaneko Misuzu was not so full of self-love. It is clear that she had a strong desire to be appreciated on her merits. I like to think her poems will become popular in the West.